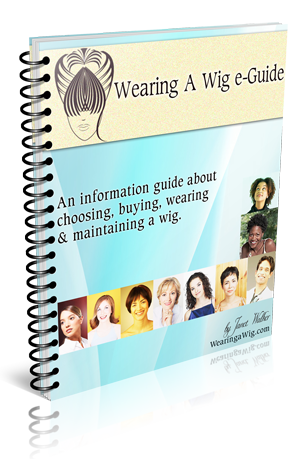 Viewing, trying on and purchasing a wig may seem like an easy routine to go through. Well I have to tell you that for many, it is not easy or routine. Don’t under-estimate your feelings and your confidence when it comes to you losing your hair. Don’t believe it’s not a major issue because it is major and there’s nothing to be ashamed of by admitting it. It takes a lot to acknowledge that you will or are losing your hair, or that you won’t be able to wear the styles you used to because your hair has gone thin. Your family and friends will support you and say all the right words, don’t be afraid to talk to your support network, let them help shoulder your worries. Talking about your fears and worries may not dispel them but they it will help you feel you are not alone. My personal experience found my mother in this exact situation. She had breast cancer and was going through chemotherapy, so the doctors warned she may lose her hair. My mom had beautiful hair and she adored her mane, so to her losing her hair was more horrifying than losing a breast. That may sound harsh but these where her words and when she told me what she felt, I kind of understand where she was coming from and what she was feeling. It took a lot of strength for her to acknowledge that she may need a wig at some point. However when the nurses came round first time she was not ready and I supported her decision. This is why you have to remember that when it comes to accepting the fact that you may lose your hair it can be a major shock to the system. It’s a big hurdle to overcome, and there is no easy answer to when you will get over it. All I can share is that it will take time but when you have conquered that hurdle, feel proud of yourself for you have achieved a lot. I’ve been without hair for 2 years, while I battle cancer. I originally went in 2 years ago, before my hair fell out and matched it exactly, color and style. But after 2 years, I’m tired of it. So I went back yesterday. I must have tried on 20 different wigs, slowly branching out of my comfort zone. My original wig is a dark brown pixie cut. I just got a blonde shoulder length wig that wowed me! Chemo has changed my skin tone and this looked more natural on me than my original hair. So, if you’re not wowed by the wigs you’ve tried on, get out of your comfort zone and try something you wouldn’t think you’d like in a million years. You are a strong powerful woman and a awesome role model. It shows that wigs that are not your more natural choice could be a surprising choice after all. Hi Lori, just thought I’d share with you my experience of hair loss. It’s been thinning since I was about 25 and now I’m 57, and it’s my 4th day of wearing a wig. I’ve been so stressed out about it and not eating properly I’ve lost over half a stone in two weeks with the anticipation of it all. I’m lucky I do have supportive family and friends but it doesn’t make it much easier. How long does it take to get used to wearing the hairy hat..Everyone tells me it’s very realistic but I seem to be obsessed that it oe sent look right. Some words of inspiration would be much appreciated. By the way mine is also a redish pixie cut also. Thank you for sharing your story. I’m sure more ladies with join the discussion and help you get use to wearing your wig. Keep us updated on your progress whether good or bad her are here to help and support. Next story What are Monofilament Wigs?